By Kojo Pumpuni Asante, Franklin Oduro & Awal Mohammed. On 1st August 2014, the Government of Ghana (GoG) announced that it would approach the International Monetary Fund (IMF) for assistance to help stabilise the economy. For watchers of Ghana, this decision is long overdue. What is, however, puzzling is how Ghana, Africa’s donor darling, paragon of democracy and good governance, the fastest growing economy in the world in 2011 (after becoming an oil producer at the end of 2010), and one of the world’s newest lower middle income countries, could experience such a dramatic turn of fortunes in just two-and-a-half years. The Ghanaian currency, the Cedi, is now the worst performing currency in the world, depreciating against the US Dollar by 33% as at July ending 2014. Worst still, the gross debt to GDP ratio is 66.5% as at April 2014; inflation is 15% since the beginning of the year while the GoG has been running an average deficit of over 10% since 2012. The extremely high cost of living engendered by the economic crisis, has led to protests on the streets from labour unions and for the first time under the 4th Republic, a largely middle-class group, known as Concerned Ghanaians for Responsible Governance, has also taken to the streets demanding immediate government action to mitigate the difficult economic hardships. So what explains Ghana’s rapid economic deterioration in just over 2.5 years? The protesters on the streets argue that it is the mismanagement and corruption of the John Mahama-led National Democratic Congress (NDC) administration that is to be blamed. The Finance Minister, Seth Terper, has consistently maintained, since 2013, that it is the fall in cocoa and gold prices, broken promises of the donor community, a high public sector wage bill and the structure of the Ghanaian economy that are responsible for the economic downturn. It must be acknowledged that the structural features of the Ghanaian economy, which is largely agrarian and import dependent and therefore susceptible to commodity price instability shocks, has contributed to the current economic woes – but it does not explain why the GoG has failed to anticipate an obvious challenge associated with natural resource dependent economies and to address it. We argue that the issues of economic mismanagement and corruption are really symptoms of the prevailing ‘political settlement’ (the underlying distribution of power and economic benefits amongst elites in a society) in Ghana that structures the behaviour of political elites, with implications for development outcomes. In a recent panel discussion organised by the Ghana Center for Democratic Development (CDD-Ghana), an ESID partner, a group of ESID researchers working on Ghana shared initial findings on their ongoing work in the areas of the politics of education sector policy reform and implementation in Ghana, governance of Ghana’s recent oil discovery and the challenge of spatial inequality in Ghana, among others, using the political settlement framework. Their analysis shows that Ghana’s current ‘Competitive Clientelist Political Settlement’, that combines multi-party political competition and clientelist practices, has had a negative impact on overall development outcomes in the country: preventing progress, particularly in terms of dealing with the structural challenges facing the Ghanaian state. While they agreed that, over the last two decades, Ghana has made some economic progress, the challenge of turning growth into structural transformation that fosters inclusive development, and addressing deep regional inequality, remains. Particularly worrying, the researchers argue that Ghana’s political settlement – underpinned by the competitive electoral politics – has generated perverse incentives for ruling coalitions to look for short-term policy responses at the expense of long-term policy choices that deal with the structural challenges facing the Ghanaian state. For example, in education sector policy reform, ruling coalitions are said to have focused attention more on access issues at basic levels, at the expense of quality issues and access to higher education, which are critical for building the knowledge base for industrialisation. Similarly, the underlying distribution of power amongst elites under the 4th Republic, which has adversely incorporated elites from the northern parts of the country, has ensured a persistent inequality in the allocation of resource to the poorest northern regions, widening the north-south divide in Ghana. Lastly, the prevailing power configuration in the oil-rich Western region has weakened the bargaining power of local elites and citizens in negotiations with the State over the benefits from the oil wealth, with negative implications for the emergence of inclusive forms of development in the Western Region. In our view, therefore, a deeper understanding of Ghana’s political settlement framework provides a very good leverage for understanding Ghana’s mixed development outcomes in recent times, and may also deepen our knowledge on how best to deal with Ghana’s structural economic and political problems. Kojo Asante is Senior Research Officer at CDD-Ghana. 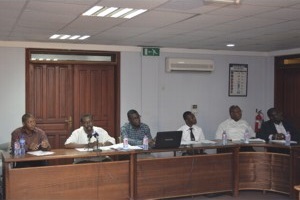 Franklin Oduro is CDD-Ghana’s Head of Research and Programs and Deputy Director. Awal Mohammed is Research Office at CDD-Ghana. Find more about our partner’s Ghana research at CDD’s website. Read ESID Working Paper 28: ‘A dynamic mapping of the political settlement in Ghana’.